This title is something of a misstatement, as it would more accurately be Foveon/Sigma versus everyone else in the world. All DSLR imaging sensors except the Foveon use Bayer technology. Digital color images are created by capturing red, blue, and green pixels and then combining them to create a full color image. All current sensors except one use Bayer technology. The sensor consists of X megapixels, or light gathering cavities. The sensor is covered with a Bayer array, which is a series of microlenses that allow only certain colors to fall in certain cavities (or pixels). The microlenses are arranged in a defined grid that consists of alternating red-green and green-blue filters. If you noticed there are twice as many green as red or blue areas in the above image, that is by design in the Bayer array. The human eye is more sensitive to green light than red or blue and the Bayer array uses this fact to produce images that appear to have finer detail and less noise. The doubling of the green receptors is corrected in the image processing. You see the scene as the left of this pair, but the camera sees the same scene as the Bayer array on the right. 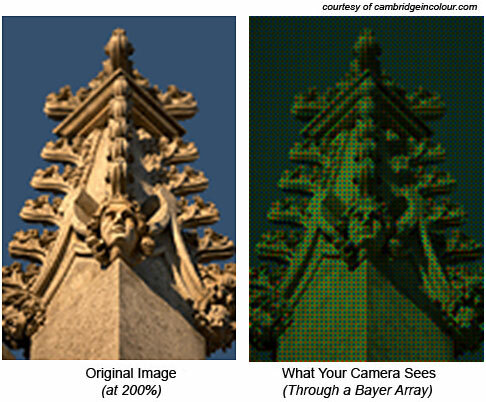 Since 14MP in a sensor does not mean 14 megapixels of each color, the color is reconstructed by interpolating the collected color mosaics for each color in a process called Bayer Demosaicing. This process "fills-in" the in-between color pixels by interpolation, using pattern assumptions and mathematical calculations to estimate the missing color pixels. Anyone who has worked with interpolation knows that it is never as good as discrete image capture, but the Bayer array sensors do an amazing job considering the way they operate and calculate color data. FujiFilm produces one current DSLR with a variant of Bayer technology. It is called the Fuji S5 Pro and is basically a Nikon D200 body with a Fuji Super CCD sensor. The Fuji S5 Pro uses the Nikon lens mount. The Super CCD still uses red, blue and geen pixels in the same standard Bayer ratios. However, the shape of the pixel is octagonal rather than the square or rectangular pixels in other Bayer arrays. In the latest version Fuji also added smaller photosites between the normal pixels to gather "dynamic range" data. Fuji has updated the camera body from the S3 to the S5 in the past year, but the sensor has not been updated for more than 3 years. The current Super CCD is still a 6.3 megapixel sensor, but Fuji specifes it as a 12.3 megapixel due to the addition of the tiny "brightness" pixels. Tests indicate the true resolution is more comparable to an 8 to 10 megapixel sensor from competitors. 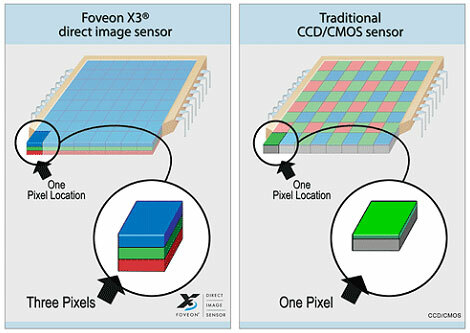 The Fuji sensor is still basically a Bayer sensor with a different shape for pixels. The Foveon sensor is a totally different approach to digital camera sensors. Traditional color film uses red, green, and blue sensitive color layers in the emulsion to capture the image. The Foveon uses the same approach to image capture with three overlapping layers of light gathering, with each layer sensitive to a different color. There is no demosaicing or interpolation step with the Foveon sensor. Where before there was one pixel of color information, the Foveon is now capturing red, green, and blue data pixels in the same pixel location. On the surface, this certainly appears a superior way of capturing color images, but things are not always as they appear. It is fair to ask: if this approach is so good then why is Sigma, a minor player in the digital camera market, the only company to embrace the Foveon sensor? A closer look at Foveon specs helps to understand some of the issues. 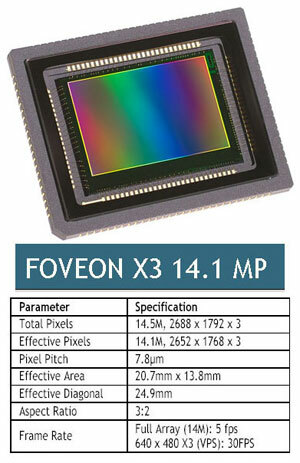 The top current Foveon sensor is the 14.1MP Foveon used in the Sigma SD14 digital camera. Foveon gets to the 14.1MP total by counting all pixels used to create the finished image, which is 2688x1768 pixels or 4.7MP. Many would argue this is fair since each pixel in a competing 14.1MP is only collecting one piece of color information. However, the practical reality is that a 14.1MP Foveon is reported to be about equivalent to an 8MP Bayer DSLR when shooting JPEGs and about as good a 10MP camera when shooting in the preferred and native RAW mode. The apparent resolution then is somewhere between the 4.7MP image size and the 14.1MP that are used to create that image. Several other issues have also held back Foveon. Where the best Bayer cameras can now capture useful images at ISO 1600, 3200, or even higher, the Foveon sensor is best at lower ISOs. It is usable to about ISO 400 and then noise climbs rapidly as the ISO increases. The latest SD14 Foveon is reported to be better in ISO sensitivity, but it still falls far short of the extended ISO performance of its competition. The other major issue with the Foveon sensor is that the separation into 3 distinct colors for each pixel site is not nearly as straightforward as Foveon describes it. The captured image still requires a lot of image processing to extract the 3 colors from each pixel site and reconstruct the finished image. In fact some critics claim the image processing required by the Foveon sensor is even more extensive than Bayer Array demosaicing. The purer the data in any extraction process the more faithful it is to the original capture, so the Foveon sensor may offer fewer "post-processing" advantages than it first appears. When conditions and lighting are correct the Foveon can deliver stunning images, but things in photography are rarely perfect. For the purpose of our discussion the Foveon is more a novelty than a sensor you will likely use today. Despite its limited availability, however, the concept of the Foveon sensor is as compelling as ever, and you can actually buy a production camera, the Sigma SD14, that uses this sensor. As you can see from the specs, the sensor size is 20.7x13.8mm, which places the Foveon between the Canon small APS C and the Olympus 4/3 sensor. The lens multiplier is 1.7X. I am curious why that CMOS sensor in the high end Canon camera body has excellent low black noise compared to the images from a Fuji Pro S3/S5 with its Super CCD? I have used Fuji Pros since 2004 and have discovered that my black details in low light situations include a lot of random color noise which I do not see when reviewing images from the 1DS Mark2 body. What does the Canon body do to eliminate the random color noise in low light black detail? Is it the CMOS Sensor? Is it the body processing? I've been a 35 mm fan for years, and have a significant investment including multiple lenses, macro, ring lights etc. For trips etc the smaller cameras seemed fine--always had small 35 mm, for instance. However, re the digital small cameras, the amount of compression is really disappointing. No. But if you want wide/tele and really good high iso performance a SLR is where you need to be. PS camera have alway been a compromise. Small 35mm film cameras had focus issues, and lens issues too. Plus most people use iso 200-400 film which has reasonable quality even in a PS digital camera. The biggest difference is now we're blowing up the picture to 1:1 on our monitors and can see the quality defects easily. I bet if you printed your old compact photos at something like 16x20 you'd probably be unhappy with them too. That's the sort of scale we're looking at on our monitors zoomed in. Good article, but one glaring mistake: you claimed Sony was the first to make a 12+Mpixel CMOS sensor. I think you meant the first AFTER Canon - the 5D, with its 12.8Mpixel sensor, was on the market in 2005, and the 1Ds Mark II, with a 16Mp sensor, was on the market earlier than that. The 5D and 1Ds II and III are full-frame sensors. The Sony was the first consumer (read affordable) APS-C sensor. Canon now has their own 12 megapixel consumer sensor in the XSi, which we are now reviewing. Nikon did their own designs for the D3 sensor, but they do not, to our knowledge, have the capabilities to manufacturer that sensor. Sony has manufactured sensors for them in the past and present with the D300, D60, D80, and others. Since the new full-frame is CMOS it is likely manufactured by Sony, or possibley Samsung. Sony and Samsung (who make the Pentax 14.6 megapixel sensor) jointly own several patents on CMOS manufcaturing technology. This article complete skips of fuji's fantastic super CCD technology. Its not really a traditional Bayar array, nor a foveon. True they don't produce a interchangeable lens SLR but they do make prosumer SLR's with their sensor. Also the very notable fuji f30 series cameras were made with this sensor. It was a true triumph in PS camera high iso usability. Hell, then there is no excuse for it not to be included in this article. Especially when it quite clearly states there are no other sensor options at one point. "FujiFilm produces one current DSLR with a variant of Bayer technology. It is called the Fuji S5 Pro and is basically a Nikon D200 body with a Fuji Super CCD sensor. The Fuji S5 Pro uses the Nikon lens mount. The Super CCD still uses red, blue and geen pixels in the same standard Bayer ratios. However, the shape of the pixel is hexagonal rather than the squate or rectangular pixels in other Bayer arrays. In the latest version Fuji also added smaller photosites between the normal pixels to gather "dynamic range" data. Fuji has updated the camera body from the S3 to the S5 in the past year, but the sensor has not been updated for more than 3 years. The current Super CCD is still a 6.3 megapixel sensor, but Fuji specifes it as a 12.3 megapixel due to the addition fo the tiny "brightness" pixels. Tests indicate the true resolution is more comparable to an 8 to 10 megapixel sensor from competitors. The Fuji sensor is still basically a Bayer sensor with a different shape for pixels."